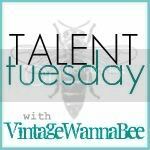 Thrillingly Thrifty: Recycled Wool Sweater slippers - tutorial! Like I mentioned in my previous post, at my first craft fair on Friday I got TONS of compliments on these recycled sweater booties - but the most common comment was "I love these but I dont have anyone small enough to wear them!" So, I figured I should try expanding my size range. Plus, I've got two toddlers that refuse to wear shoes or socks in the house, even when its FREEZING, so maybe if I make them special slippers they'll be a little more cooperative. This tutorial is from making these purple slippers for my Munchkin. She absolutely LOVES them. Want to make some of your own?! Then grab an old sweater (it doesnt have to be wool, but wool will give a much better shape and you wont have to worry about it stretching on you as you sew) and lets go! FIRST. If you are using a wool sweater, try FELTING it! I just started felting sweaters in the last few weeks and it is SO COOL. All I do is cut the sweater apart at the seams and cut off any buttons and pockets, throw it in my wash machine, turn the water to hot and the most agitation possible, add a little detergent and let 'er wash. It should shrink it right up, making it thicker and also softer. Even if your sweater isn't 100% wool, you could try felting it if it has a fairly high percentage of wool. The plum and grey striped slippers above are from a sweater that was like 93% wool. I had to felt it 3 times I think to get the result I wanted, but it was so worth it! The only warning I have to give is all the fuzz...there's a lot. It gets all over your machine, all over your laundry room floor. And I read somewhere that if you do a lot of felting in your wash machine that it might clog up the filter (or something like that) and you'll have to get it repaired. I've done 4 sweaters (one of them 3 times) and my machine's still doing great. Okay, sweater is felted...now to make your pattern. This part is by far the hardest part, but dont let that scare you off! If making your own pattern is just overwhelming, you can just use any ol' shoe pattern you want. There's quite a few free ones online, plus a lot on Etsy to buy. But, perhaps you're like me and you have children with...less than ideal feet. Alright, I'll spell it out...my kids have fat feet. (Inherited from my hubby - they also got their cankles from him.) I wanted to be able to make something that I KNOW will fit my Munchkin and Monster (plus I want to be able to make these slippers to sell on Etsy and at craft fairs) so I knew I needed to come up with my own pattern. I used measurements A (6.5") and B (2.25") , made a "t" and then drew the shape and then added the seam allowance. It certainly wasnt an exact science, but it seemed to work out. Now make a little curve inside the rectangle, like the dotted lines in the picture. Cut out this curve. The "curved corner of the Ankle piece" is what you just finished cutting out in the previous step. As you can see in my drawn rectangle, I put another dotted line...you're going to curve this rectangle too! I usually fold it in half and cut the curve that way so its even on both sides. Its not an exact science, which is why I suggested doing a test slipper out of practice fabric. Okay, now you have three pattern pieces! Take a quick breather...now on to the easy part - sewing! 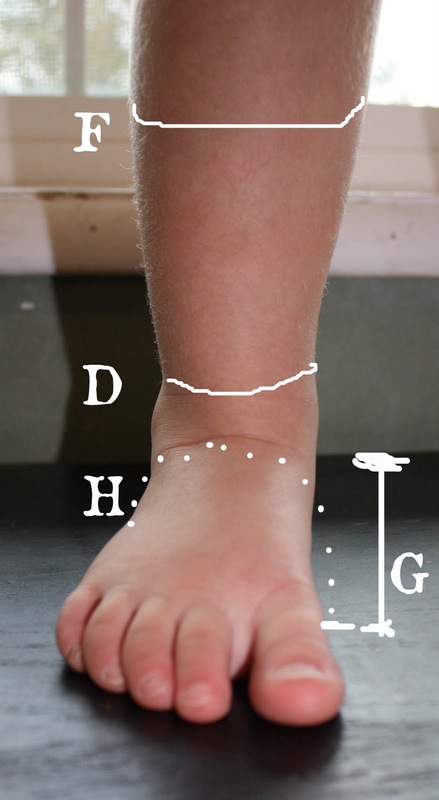 Cut a piece of elastic to the length of D (circumference of ankle). I used 1/2" elastic, but a little skinnier might have worked too. 1. Using a straight stitch, sew one end of the elastic in place. 2. 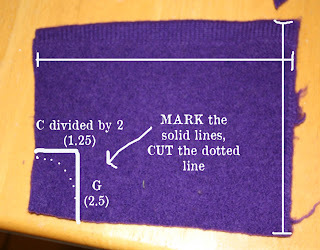 Set your machine to the longest stitch length and the biggest zigzag. 3. Zig zag right over the elastic, making sure to gently pull the elastic so that it stretches the entire length of the fabric. 4. This is what it should look like when you're done. With right sides together, stitch along outside edge of ankle piece. If you want to embellish the top of the foot of the slipper, like I did, now is the time to do it. The next part is easy enough, even if I dont make it sound easy. Your ankle piece should have wrong sides out from sewing the elastic on it. Its kind of a tube now. The two curved corners you cut out should be connected to form a nice arch. Take the top of foot piece and fold it in half, with the right side facing OUT. This fold will be perpendicular to the straight edge (folding the curve in half). Now this is what it should look like, with the wrong side out. The last step is to sew it to the sole! 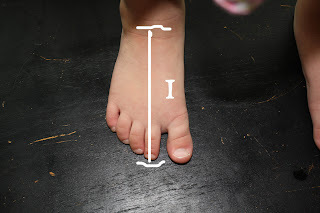 To line up the top with the sole, you could mark the center of the toes and heels and line up the marks. OR...fold the sole in half (along the length of the sole) with the right side facing out. 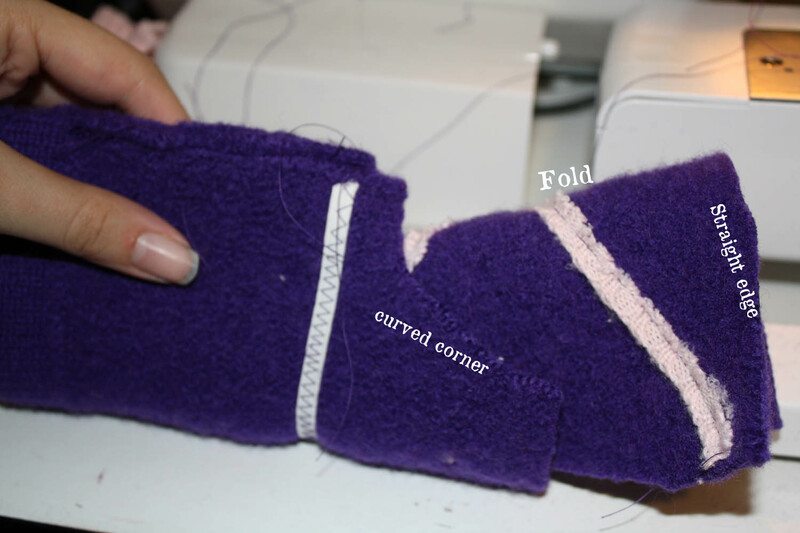 Fold the top part (ankle piece/top of foot that are now sewn together) over the sole with the right side touching the right side of the sole. You should be able to line it up and pin it fairly easily now. Stitch these two together....I usually start at the top of the toe and stitch around the outside of the foot down to the heel, then start at the top again and stitch around the inside of the foot down to the heel. It seems to line up better for me that way. Turn right side out, sew up the other slipper the same way, and ta da! You can use this pattern with any type of fabric really...I've done some cute baby booties out of cordouroy and did a lining from a t shirt! 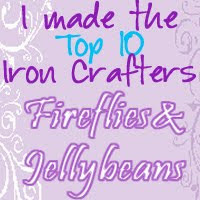 Once you get the pattern made, its kinda hard not to make a whole ton!!! Great tutorial. I love woolly slippers, and this looks delightfully easy to follow. When I felt in the washing machine, I put the wool inside old pillowcases and hold them closed with elastic bands. It saves me finding fluff everywhere and I don't have to worry about my lint filter. You might find it a bit tidier that way. And as for using a pillowcase - GENIUS!!!! I never would have thought of that myself, so THANK YOU for suggesting that! Those are so cute. I might even try making myself a pair with a felted sweater. oh wow this is such a great tutorial!!!! Those are ADORABLE! Seriously! And a FABULOUS tutorial! Popped by from Seams Inspired -Thrifty Christmas Challenge and glad I did! What a great tutorial! I love these, I really want to make some for myself now that it's getting cooler! I love these! thanks for the tutorial! I am your newest follower! i voted for these, as i think that they are the most like a storebought item, ie. well designed, good proportions, good color scheme, etc. so our readers can find you too! (not sure why I'm "B".. I'm Gretchen. lol. Anyway.. do I make an inverse in a different lining-type fabric (wanting to do fleecy or softer something to line my corduroy ones) do i still put the elastic in the lining? surely not.. Here's my thinking: Make an inside out slipper top part (sans elastic) and sew the soft stuff on top of the sole, right sides out, fuzzies on inside, cute corduroy outside, and then just slip the inside-out slipper into the right-side out slipper, sew up the top and bottom edges, and then sew the whole thing onto the now-one-piece sole. Thanks everyone for the compliments - it always brightens my day to read them! -At first I thought about sewing the elastic on the lining rather than the outer, so that it wont be seen, but I think sewing just on the outer will hold it in place better, even if it is visible. I think the way you're describing, Gretchen, would work okay too, but then again I think my brain went to bed when the kids did an hour ago so I could be wrong. Let me know how it turns out! Maybe I'll even post a quick picture tutorial this next week if I do get a lined pair of slippers made. If anyone makes some slippers email me some pics and I'll feature them on my blog!!! LOL I think the "B" came from my husband's Google account. I started up a blog on Wordpress and um... yeah forgot what it was called and my username and all that. Those booties are AWESOME and ADORABLE! Great work. I'm so glad you linked this up. Great tutorial, too. Thanks! Those are great! 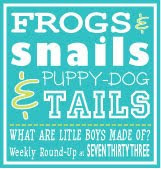 Do you mind if I link to your tutorial on my blog one of these Tuesdays (Tutorial Tuesday)? I have a blog devoted to recycling sweaters. As for the washer... you can put the sweaters in pillow cases to contain the fuzz, but I think the important part in keeping your machine healthy is running a load of regular laundry immediately after a load of sweaters, to flush out the fuzz. I have felted literally 100's of sweaters in my washer, loose and not in pillowcase, without any issues at all. I think it's when you allow the fuzz to dry inside your machine parts that it starts to cause a problem. Great, thank you! I will probably put it up in the next week or 2, since i'll probably be too busy to come up with anything on my own for the next few weeks. these are great! 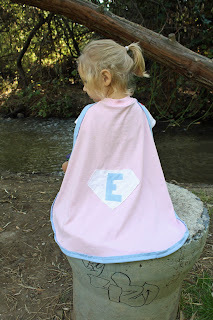 I am bookmarking this for a project to do later - thank you for the inspiration, very clever! Thanks!!! I saw these over at Tatertots and Jello and knew I had to come and see. I went to buy booties for my five month old yesterday, and I only found one pair! BRRRR....it's cold. He needs more. These are great. 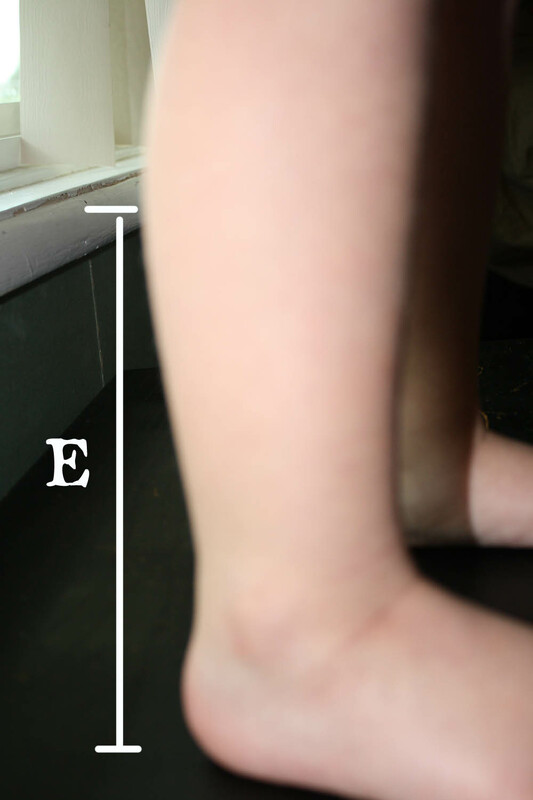 Oh yeah, my two-year-old has those crazy feet too. Awful! Found your post at Tatertots. These are awesome. I have a couple of shrunken by accident sweaters that would be perfect for this project. This tutorial was a lot of work and you did an awesome job. THANKS! Great tutorial! I just blogged about my wool slipper experience a while back, but there's no way I could walk anyone through that craziness. I love the tallness of these slippers. I may just have to make some more! 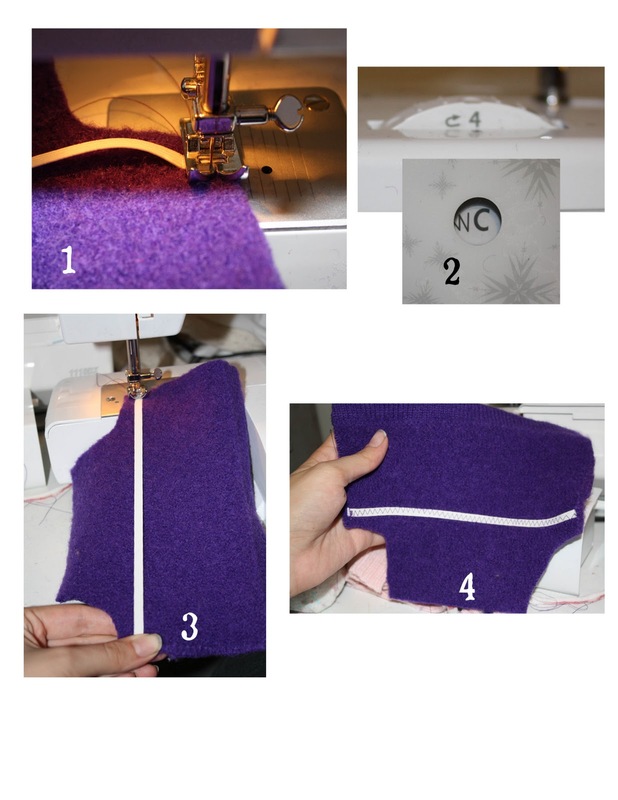 I love this tutorial but in the first few pics of your daughter wearing the purple slippers it looks like there are little grippers on the bottoms of the slippers. Can you tell me how you did that? I wanted to add a link to the pair I made and hope I did it right so you get to see the pair I made for myself and am now selling in my shop. SOOO excited to have found this! I'm making last minute Christmas presents for my kiddos (who suddenly all asked for slippers). Money is tight, and I had these already felted thrift store sweaters that I'd meant to make into longies when I was attempting to cloth diaper my triplets (now 3 and potty trained...mostly). All I had to do was cut them out. I TOTALLY eyeballed everything (I'm such a slouch, and I hate to measure). I did sneak in and make sure things were long enough, or wrapped completely around. I also picked up some of that fabric that's like the bottoms of footie pajamas (we have some very slick floors). I still used the sweater for the inner, just added the non skid fabric. They turned out cute...and probably too big. I won't know till Christmas morning (I tried to sneak in and slip them on...but he was having none of it, and I didn't want to risk waking him!) But I think they're pretty cute! Only 3 more pairs to go...and then I think I'll make a pair for me!! Maybe I'll try and actually measure the next one! If one of them will hold still! It's actually a great and helpful piece of info. I am happy that you simply shared this helpful info with us. Please stay us up to date like this. Thanks for sharing. Thanks! Making these tonight, Christmas Eve, for my sleeping babes. 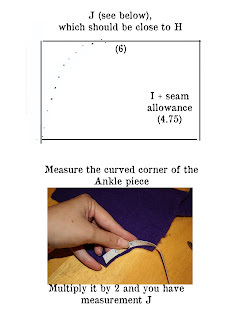 "Your ankle piece should have wrong sides out from sewing the elastic on it. Its kind of a tube now. The two curved corners you cut out should be connected to form a nice arch. 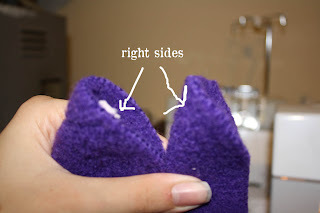 Take the top of foot piece and fold it in half, with the right side facing OUT. This fold will be perpendicular to the straight edge (folding the curve in half)." was I supposed to sew the of the ankle pieces together? I just cant tell what's going on.... Wish I knew how to upload pics of what I'm doing so you could tell me where I went wrong!! would you mind emailing me? allisongbowers at gmail dot come. I would really appreciate it! I am excited to make these- but I have one question: I've done my measurements, and am starting to make my pattern: you add a seam allowance to most of the measurements, but not to the "C divided by 2" and "G" notches- should I add a seam allowance there, in essence making those notches smaller, or not worry about it? Thanks so much!